When Rosa Parks was arrested for refusing to yield her seat on a public bus to a white man on December 1, 1955, JoAnn Robinson, a leader in the Women’s Political Council, worked through the night to organize an action of mass economic noncooperation. King was unanimously elected to lead the Montgomery Improvement Association, which would sustain the boycott of city buses. 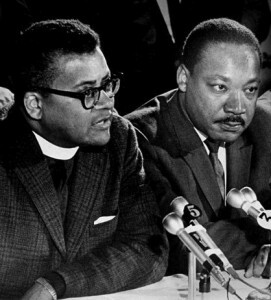 James Lawson and Martin Luther King during the 1968 Memphis Sanitation Strike. Photo by Jack E. Cantrell. Would you say that the methods function independently of “the power of Love”? I would usually refer to both King’s methods and a clearly spontaneous action like the defusing of a violent conflict in Terry Dobson’s “Aikido in Action” (http://www.context.org/ICLIB/IC04/Dobson.htm) as nonviolence. Are they not actually the same sort of thing at all? It seems to me that the passage in which Mary King refers to MLK’s conversion toward the concept of love in Gandhian nonviolence suggests that it is integrally connected with the “logic, skills and techniques that must be learned.” Right? King’s application of agape Love is something about which I have written in detail in my book Mahatma Gandhi and Martin Luther King Jr: The Power of Nonviolent Action (UNESCO 1999; Mehta Publishers, New Delhi, 2002) and requires too much length to go into here. It is, however, important to realize that while the terminology is contested, the selection of nonviolent means in pursuit of political and social goals is the technique’s core characteristic. The word “nonviolence” is paricularly ambiguous and multifaceted. Strong arguments have been made against its use without a qualifier, because it may suggest a creed, faith, or belief system. Ethical, normative, religious, and spiritual principles are often implied, yet not necessarily required. In building a movement, one needs the largest, broadest range of participation possible. So using terms like nonviolent action, nonviolent struggle, or, increasingly, civil resistance are favored because they desrcibe the type of action involved. Gene Sharp in Waging Nonviolent Struggle (2005, pp. 20-21) puts it this way: “The use of ‘nonviolence’ is especially unfortunate, because it confuses . . . forms of mass action with beliefs in ethical or religious nonviolence. . . . usually unrelated to mass struggles conducted by people who do not share [ethical or religious] beliefs.” Numbers count, so one would not want to exclude anyone. Thanks for this excellent background. I know some details…. how A.J. Muste and A. Philip Randolph tamed up to overcome the hostility of some in the Black leadership to Bayard’s going to Montgomery. I’d love to have yr email address. Anyone who ever worked with Bayard Rustin would recall his brilliance and savoir faire. That he could be controversial and had some detrators is a given, but does not obscure his strategic wisdom. Dr. Martin Luther King took nonviolent direct action to a new level. He successfully applied the tactics of nonviolence of Gandhi to civil rights and brought it to a new level. 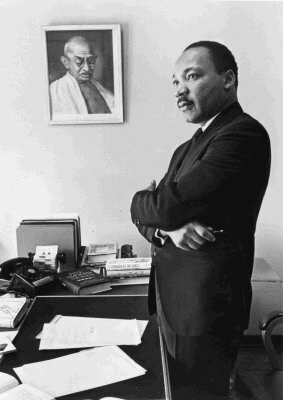 Two of his followers, who help organize and train sit-ins, marches, Freedom Riders, voter registration, boycotts and strikes, have written about their adaption of both Gandhi and King to the struggles of civil rights, workers rights, union organizing rights, environmental pollution, stopping nuclear energy and war. Their names are George Lakey and Bill Moyer(not the PBS guy. Unfortunately, Bill Moyer died from cancer in 2007 but George Lakey is still researching writing , organizing, teaching, training and advocating for nonviolent revolution. His 5 Stage Strategic Framework for Nonviolent Revolution in three books and numerous articles in alternative publications such as WIN magazine, CommonDreams and other publications such as the New York Times, Sojouners,and History is a Weapon.org. He is Director Ameritus of Training for Change and a Visiting Professor at Swarthmore College in the Peace and Conflict Studies Program and a organizer of the Earth Quaker Action Team protesting mountain top removal for the extraction of coal. Bill Moyer’s final book, “Doing Democracy: The Map Model of Building Nonviolent Direction Action Campaigns and Movements was published just before he died in 2007. He has published numerous articles, manuals and pamphlets on nonviolent direct action and training for such activity. He has an article on the MAP Model at the history isaweapon.org site. Indeed, these are two very strong contributors. Thank you for noting some of their specific contributions. Often overlooked is the fact that Lakey’s master’s degree thesis, published in 1968 as “The Sociological Mechanisms of Nonviolent Action,” in Peace Research Review, is the basis for work in developing theory on the Mechanisms of Change, which help us to understand how nonviolent action can be aimed, or how it may retroactively be explained. And in the succeeding years he has continued at high accleration to contribute. An even earlier influence was Walter Muelder, Dean of Boston University School of Theology and member of King’s doctoral committee. A committed pacifist and feminist. I’m hoping that this is just part I of a most fascinating and informative look at MLK’s “learning” of nonviolence. I’m particularly interested in the Freedom Riders and how this impacted his understanding of nonviolent strategy and tactics. Why did he not accompany the initial Freedom Riders on the fateful buses from Atlanta to Birmingham? And later after events in Montgomery, why he did not ride with them to Mississippi? How did Dr. King’s views on nonviolence mature in connection with the poor people’s campaign, Resurrection City, and his role in the Vietnam anti-war movement? Please, we want to know how this story ends, even though we know his struggle for peace, justice and equality goes on. After reading Professor Elizabeth King’s article, that was cross published on CommonDreams, I shared with us my effort at creating a movement of nonviolence and change. Prof. King asked me to share my project with you on her blog, and I gladly comply. The Science of peace… Peace research… That’s what has been the subject of my past 3 years, sunken into the trenches of the collective consciousness, which doesn’t always respond to reason, these days, and may be rather aroused by very unexpected things, like products, ideas, fantasies. At 45 I reached the threshold of feeling hopeless, and refused to fall into apathy and cynicism. I knew that alone I wasn’t going to be able to change the world, but only by finding ways to empower others, by awakening the collective in the only form of actions that are legitimate for a peaceful movement. I had 3 skills and gifts handy for taking my shot at changing the world. One is a degree in Social Psychology, one is a degree in Fine Arts, and one is a stubborn and deeply intense refusal to accept injustice. This is also my world and What they’re doing to it stinks, and I will not take it anymore. If you will take the time to visit my site or google repeace or repeace.com you will find what I did. I took all the anger and all the frustration and I re-powered peace… and, while I was at it, I found out that the act of realizing peace has always existed. It is now in Egypt, Greece, Spain and now rising in the USA. I am not good at making elevator pitches, and I could go on and on, trying to explain something very simple. I have been thinking and researching on peace, love, and finding ways to mobilize nonviolent resistance, adapted to our culture and our time, which is very important. As my repeace project has extensively revisited the concept of peace, my mind and heart has been visited by the meaning of love, and how society can be pragmatically be mobilized by something that promotes love, as I found something that promotes peace. It is no coincidence that the spirits of JFK, MLK, Gandhi, and some of the most famous quotes in history are now being echoed and reposted on Facebook, on digital images, on Youtube videos, or on card boards at Occupy events. The renaissance is here and is taking shape. I see it clearly, but it has to be pulled out of her cocoon. Love, this ethereal and elusive concept is misunderstood, as it is peace. I think of empathy, compassion and sharing, as the elements that build the foundation of the ability to love, maybe then…yes..in a relationship. I believe that divisiveness, hatred, fear instilled mistrust, religious fear mongering, Taoistic religion views (“our God is the one, the sole worthy of worship”), cultural customs to raise men who don’t cry, and repression of women, abuse, etc. Are all welcome tools of a society who feeds and profits from the byproducts of hatred and fear, who produces humans unable to feel empathy, and replace the soul based feeling, with the cognitive perceptual experience of pleasure by witnessing extreme forms of pain, abuse, violence, by others, or inflicted by own actions. Punishment of citizens who feed the poor (article in New Orleans), arrest of a priest at OWS events, just to name a few, are government acts of intimidation, ultimately part of the bigger picture of the clear plan, of extinguishing our instinct to help and care, share, love. This instinct, this underlying and still overwhelmingly ever present empathy is reaching a boil, waiting for the catalyst idea that wil allow us to realize how much we’re equal and similar, before we’re different. The perversion that has allowed political strategies and corporate funds to abuse the foundations of religions for political expedient, and the praise and justification of war and collateral casualties for some arguments that have by know crumbled to pieces, stand now like pathetic spectacles of emptiness. These are the times to challenge the basic functions of religions and appeal to the human need to care and share, that is starved for love, for laughter and peace. Anyone who enjoyed this article should be sure to take a look at Ken Butigan’s follow-up, which provides resources about organizations around today that offer nonviolence training. I appreciate your emphasis on how all of us can learn strategic nonviolent action. It should also be pointed out that King was reluctant at first to join the ministerial alliance to back the boycott, but E. D. Nixon, among others, pressured him into it. When I read in your essay that, “The boycott’s success—recognized when the Supreme Court ruled on November 13, 1956…” it didn’t sound right to me, because I remembered that the boycott lasted a little over a year, and it hadn’t begun until early December 1955. You are right, the Court did rule on the case of Browder v. Gale on November 13 (see http://mlk-kpp01.stanford.edu/index.php/encyclopedia/encyclopedia/enc_browder_v_gayle/), but the city and state tried to get the Supreme Court to reconsider. It was the court’s rejection of that motion, on December 17, 1956, that led directly to the desegregation agreement between the bus line and the MIA that led to the famous first legally integrated bus ride in Montgomery on December 20, 1956. The Browder Supreme Court decision came in the nick of time, because the city was cracking down on the MIA’s carpools (utilized based on the experience of the Baton Rouge, LA bus boycott of 1953), by claiming they were an illegal taxi service, thus jeopardizing the MIA’s ability to continue the boycott. And the decision itself, it should be pointed out, was partially an outgrowth of the NAACP’s multi-decade campaign (see http://journals.chapman.edu/ojs/index.php/VocesNovae/article/view/200/546), partially led by Thurgood Marshall, to build a legal case for overturning segregation in schools and beyond. I always learn from you. Non-violence is a power within all of us the need is to believe in it.